In this post, we explain the changes that are happening for English Advanced as Stage 6 students begin the New 2019-2023 curriculum. Essays are out, multimodal tasks and imaginative recreations are in! But what does this mean for you? The Year 11 English Assessments have undergone a significant revision with the new Stage 6 Syllabus for English. The number of assessments has changed and the types of assessments you will undergo has changed, too. These changes have been made to prepare students for the new HSC for English which has similarly undergone a substantial overhaul. In this post, we will go over the new assessment tasks for Years 11 and 12. What’s new with Year 11 English Advanced assessments? 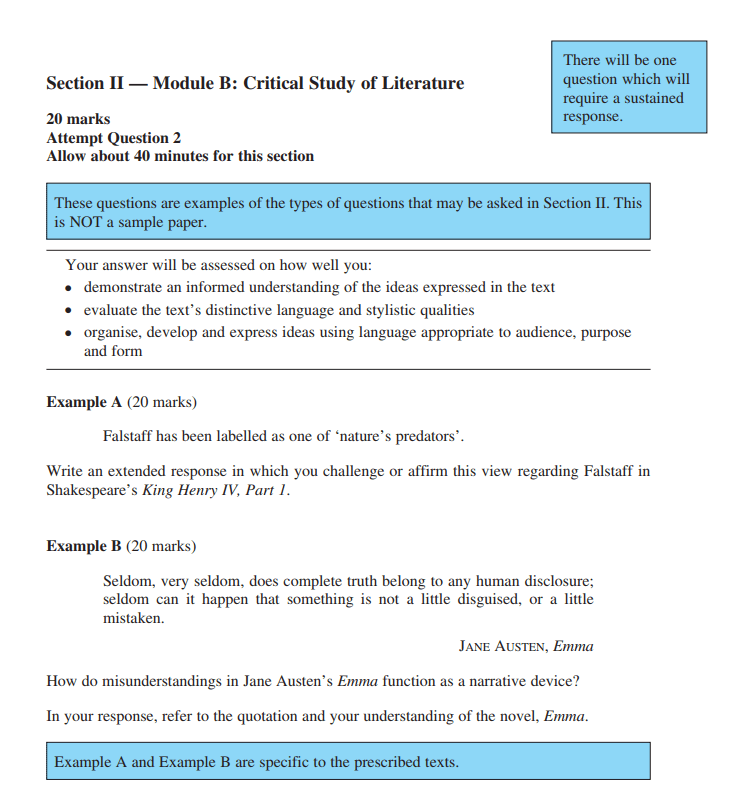 Module B: Critical Study of Literature (you can find an overview of Year 11 Module B in this Guide article). Schools do not need to have an end of year examination for English (whether students have an end of year exam will be up to their individual schools). What does this mean for you? Well, there is good news – fewer assessments – and bad news – more challenging tasks! These changes to Year 11 assessments reflect the broader changes to the HSC for English that you will face in Year 12. The new HSC for English is designed to test student knowledge of texts and concepts in a way that actively prohibits memorisation and rote learning. From 2019, the HSC will use questions that prevent students memorising responses! 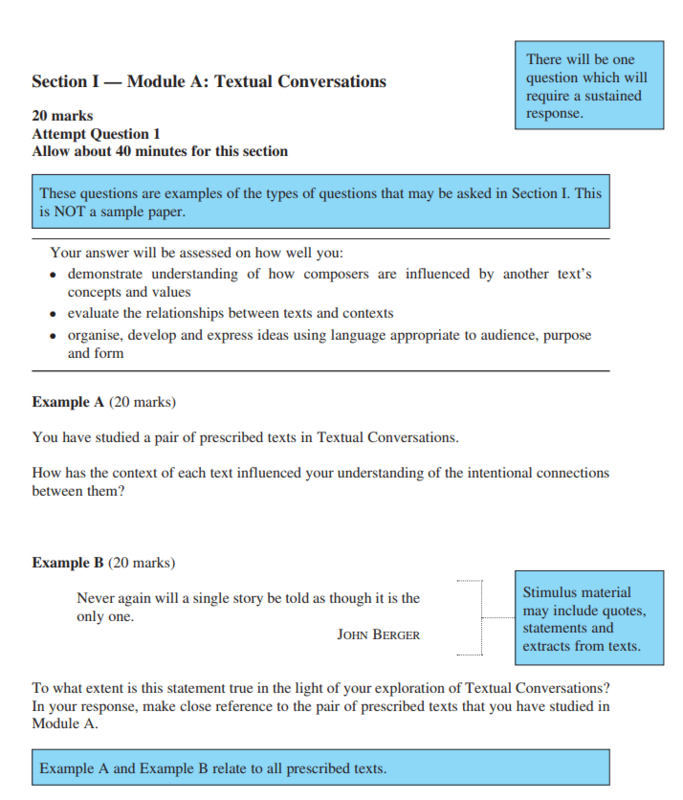 The format for the HSC from 2019 moves away from the traditional essay questions about texts and techniques and instead focuses on compelling students to demonstrate their critical thinking skills and knowledge of texts. Year 11 is now geared towards preparing you for these new challenges! What does this mean? Let’s have a look! To understand the nature of these changes, we need to see what is changing in terms of the HSC questions and then take a look at the new tasks for Year 11 and the Sample HSC Papers produced by NESA. But first, to get an idea of how dramatic some of the changes are let’s look at an old HSC English paper. Previously, essays were the common form of assessment. Students in Year 11 would usually do several essays, and then in Year 12, the vast majority of assessment tasks would be essays. These essay tasks were based on the kinds of questions students would encounter in the HSC. An instruction of how to respond to the statement. How accurately does this statement reflect the view of discovery explored in your prescribed text and ONE other related text of your own choosing? This question presents a normal essay question with a statement – a definition of the nature of discovery – and the question that asks you to discuss “How accurately” the statement reflects your texts. Woolf’s essays experiment with the essay form to explore the tension between participation and resistance. That is their strength. That is their weakness. To what extent does this align with your view of A Room of One’s Own and Three Guineas? In your response, you must make detailed reference to your prescribed texts. As you can see, this question also takes the form of a statement and then an instruction of how to engage with that statement. The essays for both papers, while they may have varied in difficulty, shared this standardised form. Consequently, many students attempt to game the system by memorising generic essays and moulding them to the questions they face. Memorisation is a bad strategy for exams that means that students don’t answer the questions correctly or meet the learning criteria. Matrix English Students are taught the study techniques, critical thinking skills, and essay writing skills to craft individual responses to a variety of questions. It is usually very clear that a student has memorised a response because it doesn’t address the question or only makes fleeting reference to the terms of the question. But it still persists as a common student practice. To tackle this hit and miss approach by students, the HSC essay questions in the past have simply become increasingly harder to try and deter memorisation and generic responses. However, with the new English Stage 6, the whole approach to assessment is changing significantly and HSC assessments will be very different to what has come before. The new assessment tasks will focus more on critical thinking and the sample papers for the new English HSC are a significant departure from previous papers. Let’s start by looking at the new assessment types. There are two new types of mandatory assessment tasks. NESA has included a multimodal presentation as a task to be assessed in both Years 11 and 12. Students will also face an imaginative recreation in Year 11 for a unit and will potentially need to produce one in the HSC for Paper 2 as well. While these assessment tasks are not new, the fact that they are compulsory tasks is. Let’s take a look at these assessment types and see what they can involve! In both Year 11 and 12, students will need to undertake one multimodal presentation. A multimodal presentation is a presentation that combines a variety of different modes. When NESA refer to modes they mean ways of engaging with texts or producing texts. “The multimodal presentation is designed to provide students with the opportunity to demonstrate their knowledge, understanding and skills across all of the modes. A multimodal presentation includes at least one mode other than reading and writing such as listening, speaking, viewing and representing. Speaking – delivering an oral presentation of some sort, either in person or recorded. A multimodal presentation requires you to produce a presentation that combines two or more of these modes. That means the presentation will include reading, writing, speaking and at least one other mode including representing. The other assessment task that you will need to do in both Years 11 and 12 is an imaginative recreation. This is a task that you will have encountered previously and could take a variety of forms. Using a different textual form to retell the narrative. It is possible that you might have to combine an imaginative recreation and multimodal presentation. For example, you may have to make an image about the text and then present it to the class and justify your choices. In addition to these new assessment tasks in Year 11 and 12, the HSC is getting a revamp. Let’s see what that will involve for students from 2019. 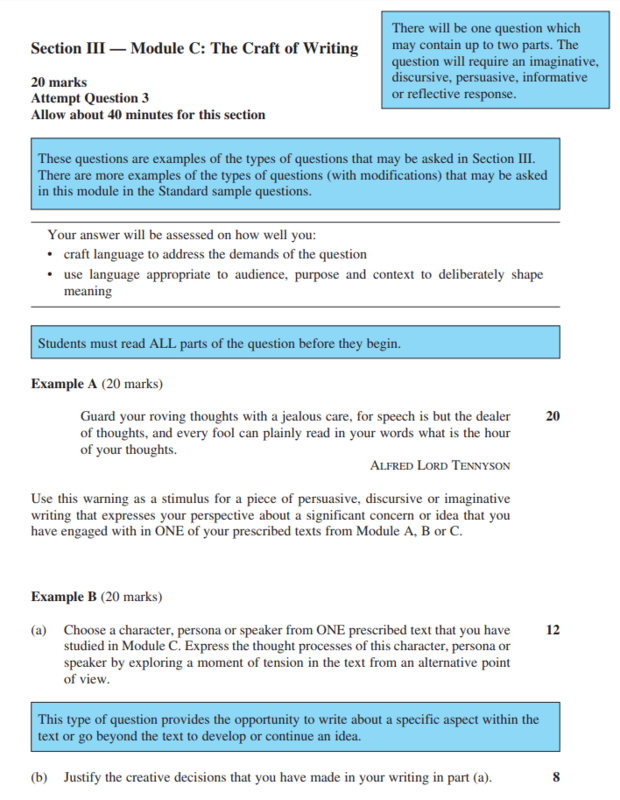 NESA (The NSW Education Standards Authority) has released its sample HSC English papers for the 2019 HSC as part of its introduction of the new Stage 6 Syllabus. By looking at these, we can see what assessments you will face in the HSC from 2019. Let’s see what they’ve changed and what it means for you. A reading and comprehension section similar to what exists currently for Area of Study: Discovery. An essay question that is specific to either the text or text type. These questions are largely the same as the current HSC, only these questions are more in line with the complexity of those currently found in Paper 2. The only way to answer this second question is by engaging with the unseen text in detail and relating to it in detail. To answer this question effectively, you would need to explain how the idea of a single story never being the same relates to a pair of texts where the more recent text is a retelling of the older one. This question requires critical thinking skills and a detailed knowledge of the text. You would not be able to memorise a response to this question. Similarly, the Module B questions are very specific and rely on an unseen quotation. These questions are designed to foil memorisation. The first question makes a controversial statement about a major character in Shakespeare’s Henry IV Part 1. The second question has two components. This is introducing a specific idea – truth and lies – that is central to the text. It presents this argument from a perspective that suggests that some lies are mistakes and others are only a little bit deceptive and that deception is an inescapable trait of all humanity. The second component is the instruction to discuss this theme, of lies and misunderstandings, as a narrative device. That is, how does Austen use this to drive the plot, develop characters, and convey meaning? This type of question relies on critical thinking and is impossible to prepare for by memorising an essay. The only way to successfully answer such a question would be to have a thorough knowledge of the text and practice at producing essays to a variety of different questions. The above questions combine critical analysis, textual understanding, and creative writing. These questions require you to respond dynamically to the question rather than relying on a prepared response. Preparing a pre-written response to this question would be close to impossible, and would likely not address the question asked and yield a poor mark as a result. The second question is particularly interesting because it requires students to produce a reflection statement to discuss their imaginative recreation and use of themes and techniques. If you are interested in learning about addressing questions like this that ask for an Imaginative Recreation, you should read Part 9 of our Beginner’s Guide to Acing HSC English. Clearly, the new English Stage 6 HSC questions will be difficult and require a thorough knowledge of the texts rather than relying on prepared responses. Remember, tasks such as the above will be forms of assessment that you will face in both Year 11 and Year 12. Are you ready for your Year 11 Multimodal Presentations? Develop presentation and speaking skills that will give you the confidence to nail your oral tasks. Find out how Matrix can help you ace your assessments.